The Government of the Virgin Islands continues to forge ahead with the cruise pier expansion project, which will see an expanded, widened and strengthened dock and the development of landside facilities to include a welcome centre, immigration and customs clearance, restaurants and shopping facilities. 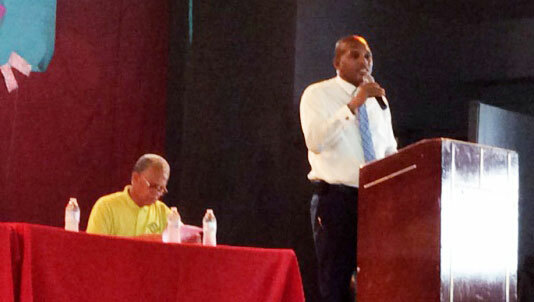 Yesterday, during the launch of Virgin Island Transportation Alliance Inc. (VITA) the Minister for Communications and Works Honourable Mark Vanterpool reiterated his ministry’s commitment to push forward with the Cruise Pier project which is expected to bolster the economy of the Virgin Islands. Honourable Vanterpool applauded VITA for its commitment to the industry. He took the opportunity to encourage all taxi drivers in the Territory to continue to provide a memorable and authentic BVI experience to visitors in order to keep them coming and with new friends. In speaking about his recent trip to St. Maartin to meet with the different cruise lines, Honourable Vanterpool said that many of the companies spoke about the high desirability of the BVI among their customers. The Minister reiterated the importance of taxi drivers selling a service and a niche, while giving tourists a tangible experience when they visit the Territory. In referencing the cruise pier expansion project, Honourable Vanterpool said he is pleased that the project is full steam ahead and he is looking forward to its full completion. The Minister is asking all stakeholders, including taxis, tour operators, vendors and restaurants to prepare for the influx of cruise passengers by way of looking at the services they will provide to help turn day trippers into overnight arrivals. This phase of the project is being completed by IDL Meridian. The Government of the Virgin Islands would like to ask the public for their continued patience and tolerance while this development is being undertaken.